The Ghent Six-day is set for another close finish with two teams on the same lap and a third team not far behind. World Madison champions Bruno Risi and Franco Marvulli are leading local rider Iljo Keisse and his team mate German Robert Bartko by just five points, with Robert Slippens and Danny Stam just one lap behind. Slippens and Stam though will gain that lap back when their points total reaches 300, as it soon will during Sunday’s last day of racing. After a slow start the British duo of Mark Cavendish and Bradley Wiggins are now in the thick of the action, picking up some of the smaller races through the night and challenging in the all important Madisons. While Wiggins has had good form all week, Cavendish has ridden himself in over the last five days having jumped straight back in to the Ghent six after an end of season holiday. While far from the finished article, the British pair are gelling nicely, which bodes well for the Sydney world cup next weekend, where the pressure of Olympic qualifying points is already apparent. Wiggins will fly out to Australia on Tuesday after a day at home with his family, while Cavendish flies out on Monday to meet with the rest of the British team. 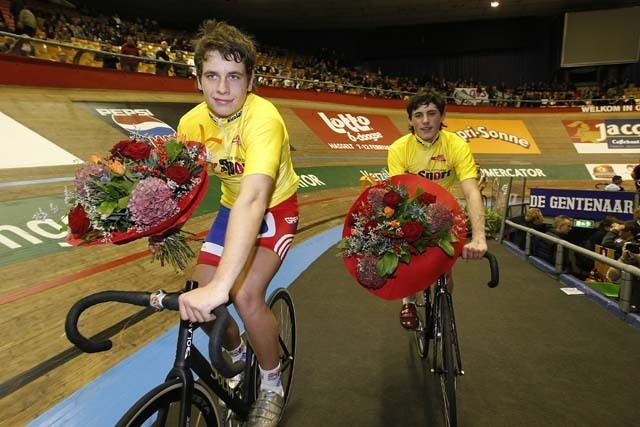 In the under-25’s UIV cup, British pair Peter Kennaugh and Adam Blythe took back the lead from the Belgian pairing. With Olympic Academy coach Rod ELlingworth giving instructions from the sidelines, the young Brits nailed their tactics right at the end of the race. Having allowed the Belgians to chase the dangerous Czech team, Kennaugh and Blythe hit out to take a lap from the rest of the field to put them back in the yellow jersey.